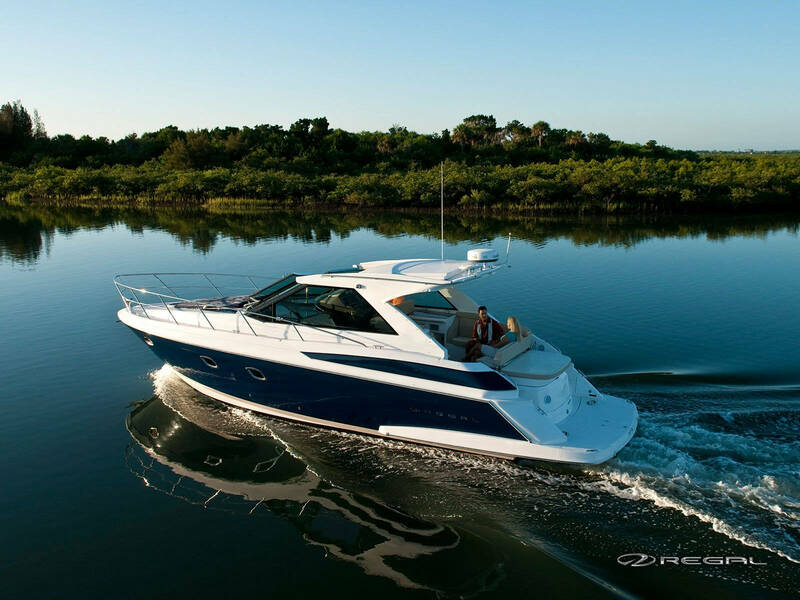 Regal Boats unveiled the third model in its growing line of sport coupes, the all-new Regal 42 Sport Coupe. 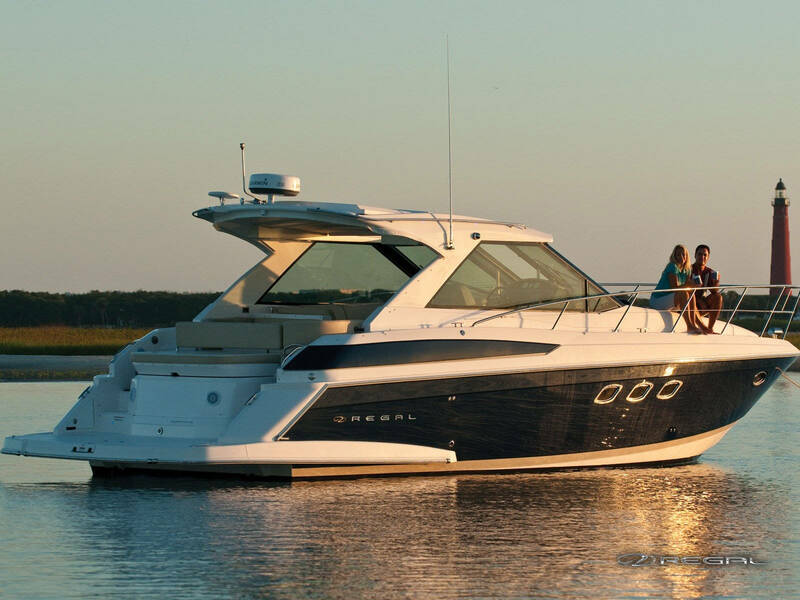 With the bold, aggressive lines of the Regal 46 and 52 Sport Coupes, the versatile, fast and fuel-efficient Regal 42 Sport Coupe is a sibling that is bound to create some royal rivalry. 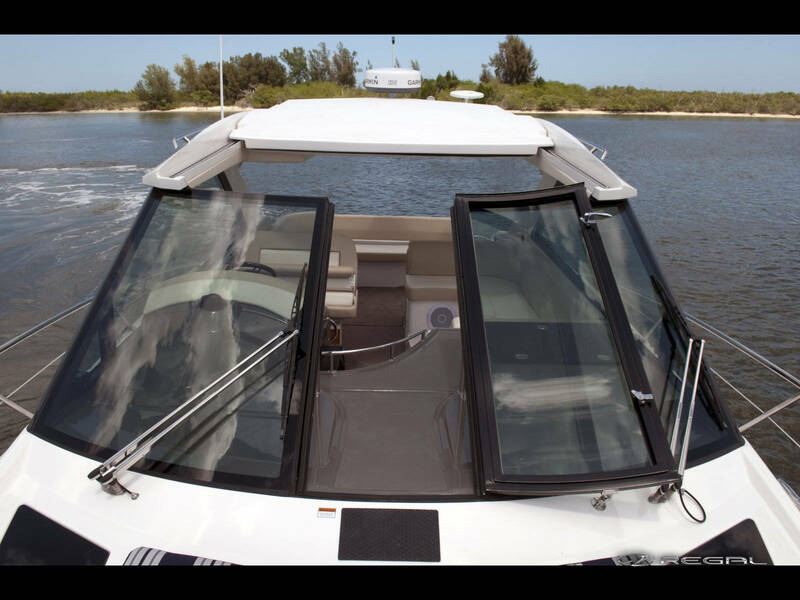 Equally adept at entertaining and offering a place to enjoy relaxing personal time, the cockpit can be completely opened up with the full-width sunroof and center-opening windshield. In turn, the single level cockpit deck area can be fully enclosed with either a canvas aft curtain or the optional slide away aft bulkhead. 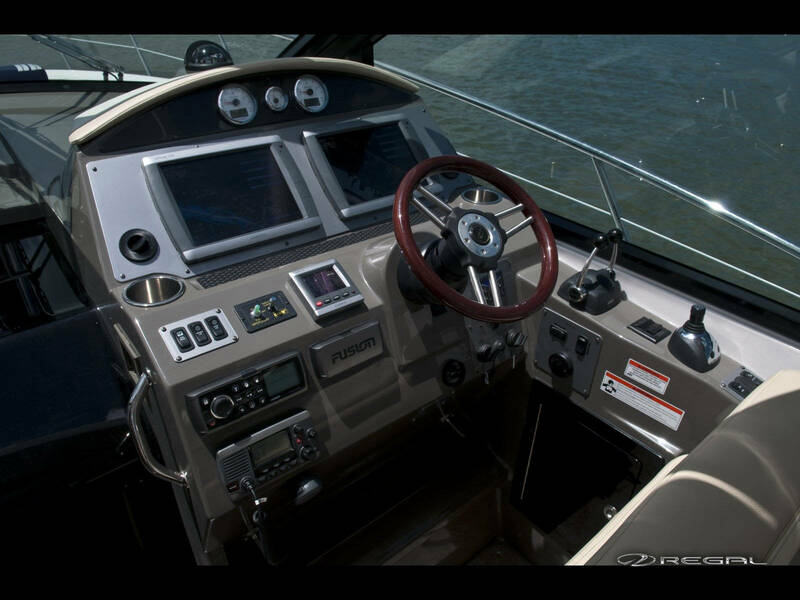 Add a 24000 BTU air conditioner with reverse-cycle, and whether you live in the cold north or warm south, the helm and cockpit stay comfortable, extending the boating season. The dash mounted Fusion® stereo system provides the tunes including a hide-away iPod dock behind the controls face. 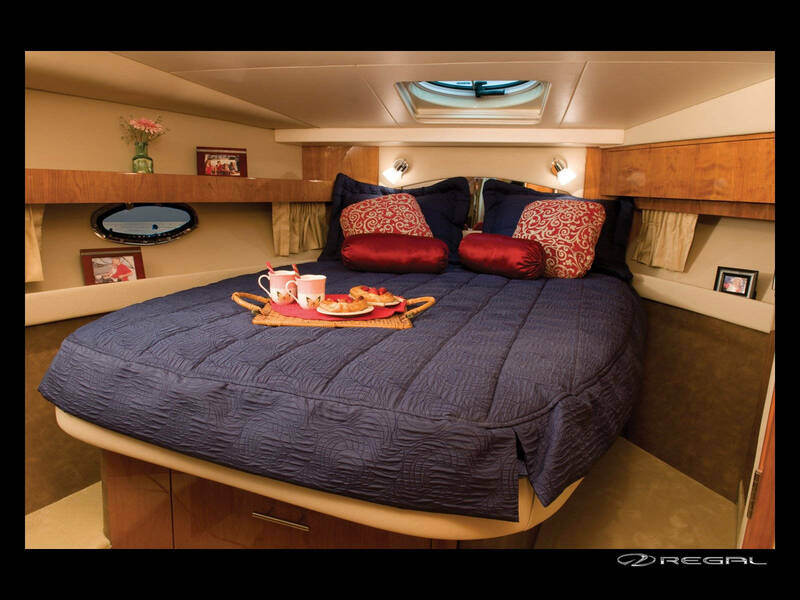 Egress below is through a centerline sliding door that leads to a port side gourmet-style galley that features handcrafted cabinetry. Spacious countertops are offered in several colors of Corian or optional choices of granite. The stove, microwave/convection oven, refrigerator/freezer and sink are conveniently arranged all within easy reach. 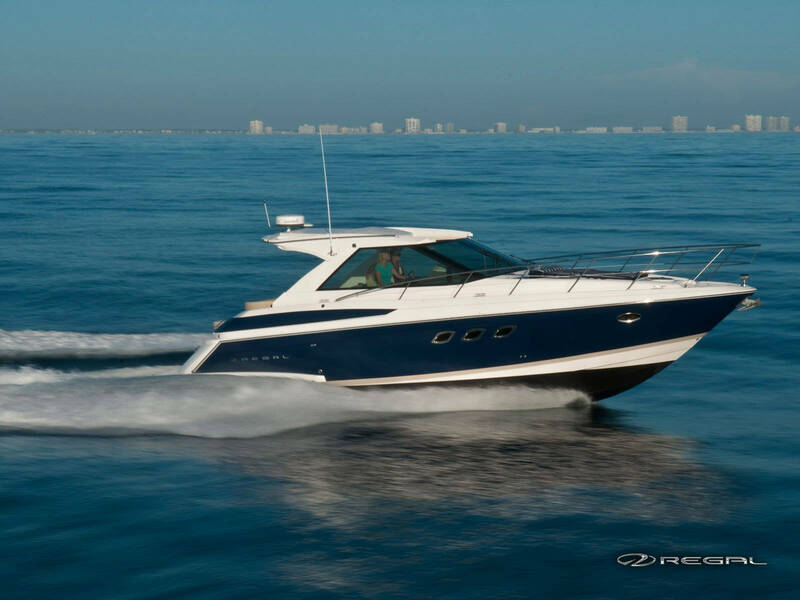 The opposing starboard side main salon keeps everyone engaged, with a forward bulkhead mounted flat panel TV and the C-shaped wrap-around sofa that converts to a full-sized berth. The well-appointed master stateroom offers lots of storage and has a queen-size walk-around berth with a separate head on the port side and shower to starboard. The mid-cabin guest stateroom provides twin berths or a single queen with bolsters in place. The en suite head and vanity are adjacent to the full standup dressing area. Regal continue to grow into new areas of size and innovation with their Sport Coupe range and its something for the Regal faithful to be excited about and those potential customers that would consider only the usual european suspects in the market segment. I’ve always liked Regal boats I think they have a winner here !